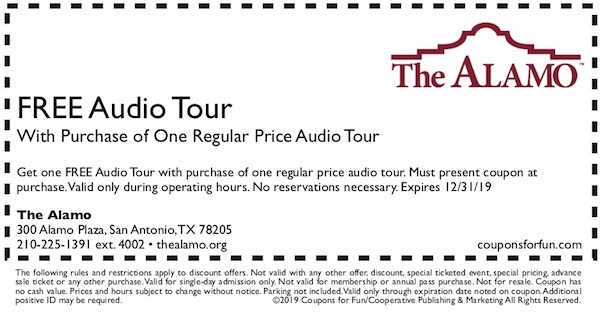 The Alamo - San Antonio, Texas - Get savings coupon for free audio tour! The Alamo is best known for the epic battle that occurred here in 1836. General Antonio López de Santa Anna had led the Mexican Army into Texas to put down a revolt against his government. Although outnumbered 10 to 1, the Alamo’s garrison fended off Santa Anna’s soldiers for thirteen days before the old mission fell on March 6. Before final attack, Santa Anna had instructed his soldiers to take no prisoners. The battle cry “Remember the Alamo” not only commemorated the garrison’s sacrifice, it drove the Texans onto victory and independence from Mexico.